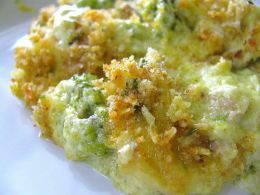 This recipe is similar to our family’s chicken and broccoli casserole recipe. It’s very good. 2.Spread chicken in the bottom of a 9×13 inch baking dish. Top with broccoli. In a medium bowl, combine the mayonnaise, curry powder, cayenne pepper, garlic salt, salt and pepper and mix well. Add 1 cup of Cheddar cheese, cream of chicken soup and cream of mushroom soup and mix again, then pour mixture over chicken and broccoli. Sprinkle with remaining 1 1/2 cups of cheese and top with onions. 3.Bake at 350 degrees F (175 degrees C) for 30 minutes.